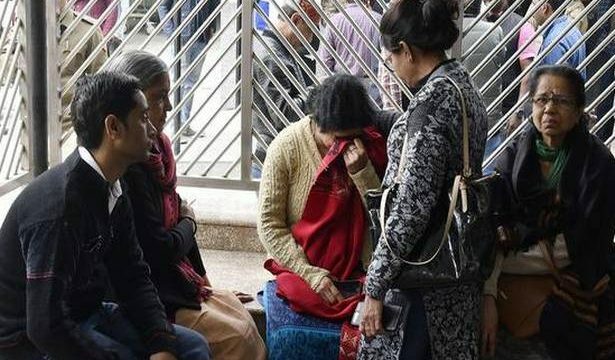 Panic, grief and disbelief loomed large outside the capital’s Dr. Ram Manohar Lohia (RML) Hospital’s mortuary on Tuesday morning where the post-mortem of 13 killed in the Delhi hotel fire was under way. The hospital got the maximum number of people who died in the tragedy, that claimed 17 lives. The cordoned mortuary area saw heavy police deployment with a small information counter set up right outside that had photographs of the deceased for identification. The counter also handled the paper work for handing over the bodies to the relatives. Ambulances and stretchers lined the mortuary unit even as bewildered relatives sat with hospital and police authorities trying to identify the dead from whatever little remained of them. He added that deaths occurred due to suffocation and burn injuries. The deceased who were brought to RML hospital include three from Kerala, two each from Tamil Nadu and Myanmar, and one from Patna. “The mortuary is full and we have the difficult task of helping the relatives identify the bodies. Some of them are charred beyond recognition. One family has identified their relatives with the help of the bangles and neck chain they were wearing,’’ said a hospital staffer. The mother of Pranav Kumar Bhaskar (32) from Bihar broke down as soon as she identified her son. “I have no one left,’ she cried. Their son is survived by two small children. “We don’t know how we’ll survive anymore,’’ cried the parents, outside the post-mortem room.